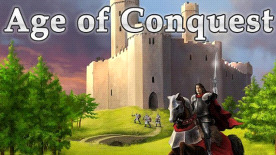 Age of Conquest III is a medieval Risk-like turn-based strategy game where you take the reins of a budding empire and struggle against fellow empires for control of the world. Every game you win pushes up your score, until you don't just dominate the world, but also your fellow players. So, will your place be in the history books or in the mud? Will you govern or will you grovel? Do you have what it takes to rule the known world?